Takeshi “Neko” Oyama. Image from Corvus Belli’s online store. 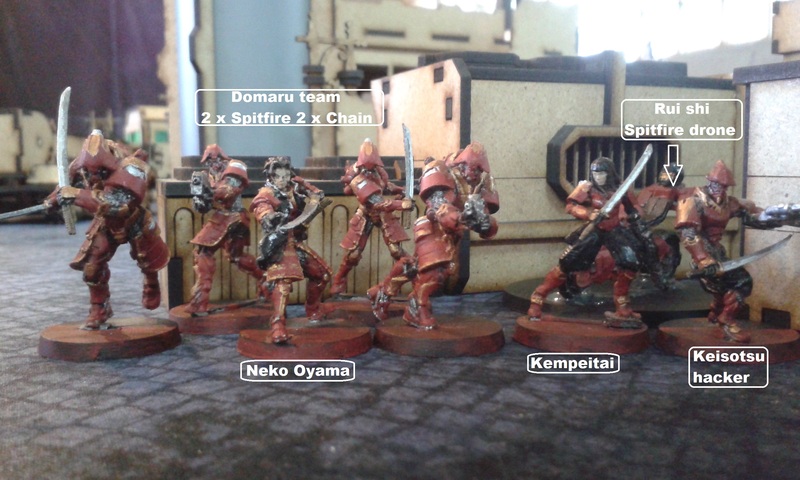 Domaru Butai. Image from Corvus Belli’s online store. Size comparison between Neko and the new Domarus. Image found on the Wotan campaign website. Although the last picture is in low quality, it can be seen that Neko is at least one head smaller than his Domaru brethren (even though they all suposedly wear the same armor), so Guillem asked me to make him a new scale Neko. To do so, he gave me a new scale Domaru and a new Keisotsu to have his head transplanted to. He also asked me to model the same vest (called “manchira” in japanese). I’m improving at modelling tunics and cloacks with lots of flow, I’m proud how this ended up. I asked my pal if he wanted me to sculpt also the cat crest (also called “mon” in japanese) that Neko wore on his back, but he refused as he wanted him to be free to paint there whatever he wanted, he loved how he looked, so my job was finished. That’s it for today’s post. We’re getting close to the Interplanetario dates, so I have to get into painting all I’m bringing to that tournment. Next week’s post will be a showcase of all my Shasvastii conversions I’ve been doing to get my army ready for this big Infinity event. Don’t miss them!